Dr. Acklema Mohammad, the head pediatrician at the Urban Health Plan in the South Bronx, helped develop the Asthma Action Plan, a national “go-to” guideline for asthma patients to understand how and when to take their asthma medication. Dr. Mohammad gives a check-up to 5 year old Asthma patient Kelvin Torres and his two year old sister, Janalisse. 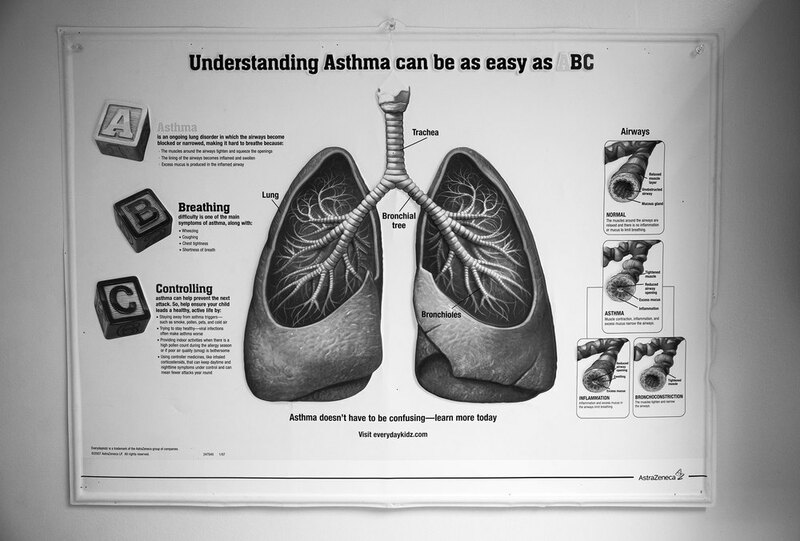 A poster hanging in Dr. Mohammad’s office is used to educate patients on the physiology of asthma: what it is, how the bronchioles constrict, how inflammation and phlegm leading to persistent cough and wheezing. With this education parents and children understand why they should take their medication daily to prevent asthma symptoms. Kelvin uses a stethoscope on his sister. Dr. Mohammad teaches Kelvin Torres how to use the inhaler to help control his asthma. All members of the Torres family have asthma, except for the daughter who has respiratory issues and its being treated as asthma. The father, Edwardo, has the worst conditions and is hospitalized every year. 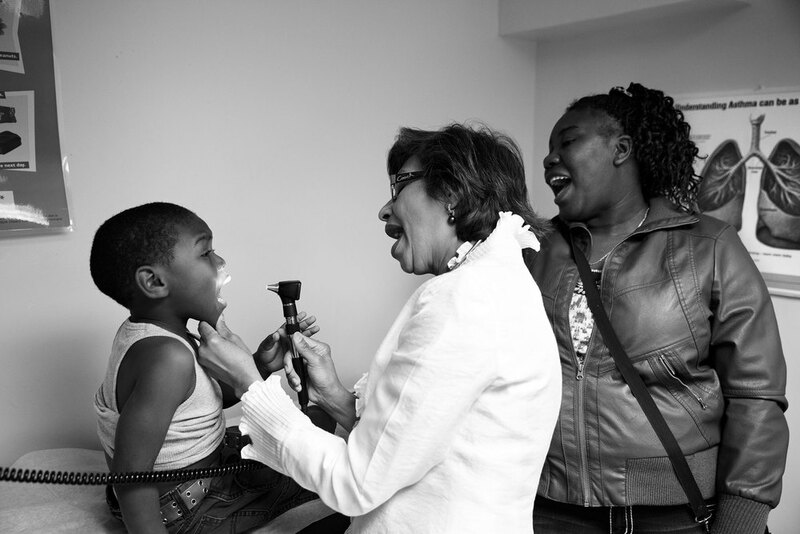 Asthma patient Onilson Avila Dionicio, 4, is examined by Dr. Mohammad while his mother watches. Dr. Mohammad looks in Onilson's ear. Nine year old Maria Rojas Atenco, who has no history of asthma, is examined by Dr. Mohammad. Dr. Mohammed started working at Urban Health Plan, formerly San Juan Health Center, in 1974. She started as a receptionist, then x-ray technician, then EKG technician to medical assistant, and finally pediatrician. Maria draws a picture for Dr. Mohammad. 5 year old Asthma patient Kelvin Torres and his two year old sister, Janalisse. Dr. Mohammad has various asthma medication samples in her desk drawers like the “pump”, spacer, diskus, which she uses to explain to patients and parents on how to use them adequately.